The curious coincidence of “known” Comets with sporadic spikes in Thorium 232 opens up a new line of enquiry that suggests the Carolina Bays have a Cometary connection. This particular line of enquiry originates from trying to determine whether the spikes in Thorium 232 originated From Above or From Below. The story starts with the strangely surreal Settled Science of Thorium 232. In a fit of omnipotent megalomania the mainstream has masterfully mandated a Galactic moratorium on the manufacture of Thorium 232. Apparently, this manufacturing moratorium was implemented over ten billion years ago. 232Th is a primordial nuclide, having existed in its current form for over ten billion years; it was forged in the cores of dying stars through the r-process and scattered across the galaxy by supernovae. Thorium deposits are associated with Rare Earth Elements and Uranium. A particular hazard is mildly radioactive slurry tailings resulting from the common occurrence of thorium and uranium in rare-earth element ores. Such low demands make working mines for extraction of thorium alone not profitable; as a result, it is almost always extracted with the rare earths, which themselves may be by-products of production of other minerals. Present knowledge of the distribution of thorium resources is poor because of the relatively low-key exploration efforts arising out of insignificant demand. Intriguingly, there is a large discrepancy in the Thorium natural abundance estimates. The metrics indicate there is somewhere between 100 and 1,000 times more Thorium in the “soil” than there is in the Earth. Soil normally contains about 6 ppm of thorium. The non-explanation for these metrics reinforces the view that most superficial deposits of Thorium and Rare Earth Elements arrived From Above in a variety of highly ionised packages. The rare earth elements are commonly found together in the Earth’s crust because they share a trivalent charge ( +3 ) and similar ionic radii. The Thorium deposits most likely to have originated From Below are in the “principal concentrations” of Rare Earth Elements found in uncommon varieties of igneous rocks. The principal concentrations of rare earth elements are associated with uncommon varieties of igneous rocks, namely alkaline rocks and carbonatites. Alkaline igneous rocks form from cooling of magmas derived by small degrees of partial melting of rocks in the Earth’s mantle. The formation of alkaline rocks is complex and not fully understood but can be thought of as a geologic process that extracts and concentrates those elements that do not fit into the structure of the common rock-forming minerals. The resulting alkaline magmas are rare and unusually enriched in elements such as zirconium, niobium, strontium, barium, lithium and the rare earth elements. When these magmas ascend into the Earth’s crust, their chemical composition undergoes further changes in response to variations in pressure, temperature and composition of surrounding rocks. The result is an astonishing diversity of rock types that are variably enriched in economic elements, including the rare earth elements. Carbonatite is a type of intrusive or extrusive igneous rock defined by mineralogic composition consisting of greater than 50% carbonate minerals. Carbonatites may be confused with marble and may require geochemical verification. Carbonatites usually occur as small plugs within zoned alkalic intrusive complexes, or as dikes, sills, breccias, and veins. They are almost exclusively associated with continental rift-related tectonic settings. The Mountain Pass deposit is in a 1.4 billion year old Precambrian carbonatite intruded into gneiss, and contains 8% to 12% rare-earth oxides, mostly contained in the mineral bastnäsite… metals that can be extracted from it include: Cerium, Lanthanum, Neodymium and Europium. This pipeline repeatedly ruptured during cleaning operations to remove mineral deposits called scale. The scale is radioactive because of the presence of thorium and radium, which occur naturally in the rare-earth ore.
Other Thorium deposits appear to have arrived From Above with highly ionised Rare Earth Elements wrapped around an iron nucleus. 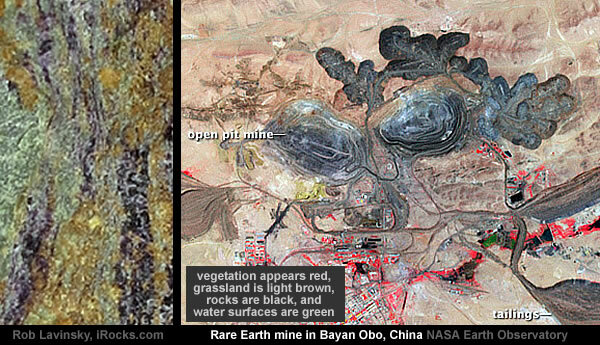 Very large rare-earth elements (REE) Fe-Nb deposit (Bayan-Obo type), discovered as an iron deposit in 1927. 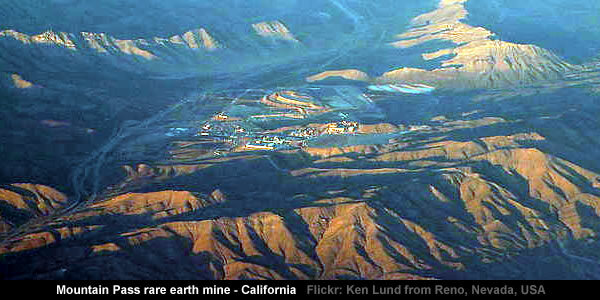 REE minerals were discovered in 1936, and niobium-bearing ores in the late 1950s. Reserves are estimated at more than 40 million tons of REE minerals grading at 3-5.4% REE (70% of world’s known REE reserves), 1 million tons of Nb2O5 and 470 million tons of iron. The deposit also contains an estimated 130 million tons of fluorite. While “secondary deposits” of Thorium and Rare Earth Elements appear to have arrived From Above as fragmented packages found in a curious array of sand and gravel Placer Deposits. In geology, a placer deposit or placer is an accumulation of valuable minerals formed by gravity separation during sedimentary processes. The name is from the Spanish word placer, meaning “alluvial sand”. Diamonds, Gold, Garnet, Iron [from ironsands containing high concentrations of magnetite], Platinum group metals, Quartz Monazite Sands, Rare Earth Elements, Ruby, Sapphire, Thorium, Tin, Titanium, Uranium, Zirconium. Secondary deposits occur at the mouths of rivers in granitic mountain regions. In these deposits, thorium is enriched along with other heavy minerals. The source need not be an alkaline igneous rock or a related rare-earth deposit. For example: The Placer Deposits found in Florida and the Carolinas are very curious. The Fission Tracks found in Floridian land-pebbles [embedded within Phosphorite] provide strong support for the concept of Thorium and Rare Earth Earth minerals arriving From Above as the fragmented remnants of an Atomic Comet. Cathcart (1949) identified three main types of phosphatic rock in Florida: land-pebble phosphate, hard-rock phosphate, and river-pebble phosphate. Only the land-pebble deposits contain a substantial amount of uranium and, in some places, also contain rare earth elements. Fission tracks in apatite are commonly used to determine the thermal history of orogenic (mountain) belts and of sediments in sedimentary basins. (U-Th)/He dating of apatite is also well established for use in determining thermal histories and other, less typical applications such as paleo-wildfire dating. The apatite in phosphorite is present as cryptocrystalline masses referred to as collophane. 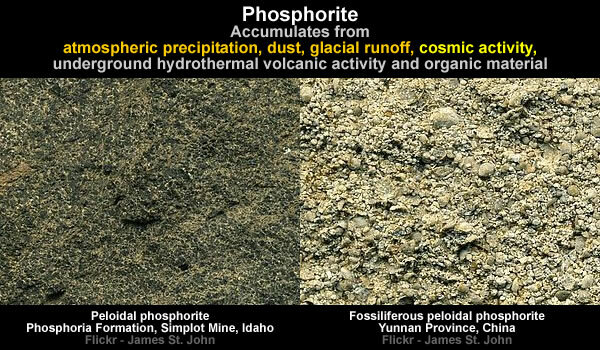 Phosphorite deposits often occur in extensive layers, which cumulatively cover tens of thousands of square kilometres of the Earth’s crust. Phosphate rich sedimentary rocks can occur in dark brown to black beds, ranging from centimeter sized laminae to beds that are several meters in thickness. Phosphatic sedimentary rocks are commonly accompanied by or interbedded with shales, cherts, limestone, dolomites and sometimes sandstone. Phosphorites are known from Proterozoic banded iron formations in Australia, but are more common from Paleozoic and Cenozoic sediments. The Permian Phosphoria Formation of the western United States represents some 15 million years of sedimentation. It reaches a thickness of 420 metres and covers an area of 350,000 km2. Commercially mined phosphorites occur in France, Belgium, Spain, Morocco, Tunisia and Algeria. In the United States phosphorites have been mined in Florida, Tennessee, Wyoming, Utah, Idaho and Kansas. 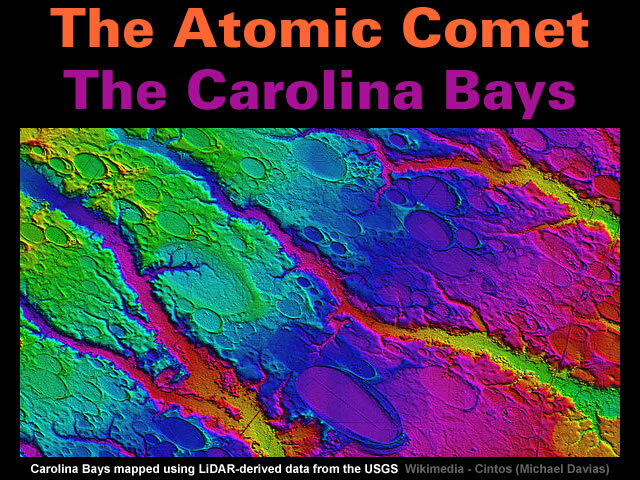 Similarly, the curious coincidence of the Carolina Bays occurring within the context of Thorium and Rare Earth Elements in Placer Deposits provides support for the Atomic Comet concept. As a result, monazite is almost always found in any placer deposit. Monazite is a REE- and thorium-bearing phosphate mineral and typically contains 60–62 percent total rare-earth oxides. Monazite (chiefly phosphates of various rare-earth elements) is the most important commercial source of thorium because it occurs in large deposits worldwide, principally in India, South Africa, Brazil, Australia, and Malaysia. It contains around 2.5% thorium on average, although some deposits may contain up to 20% thorium. Monazite is a reddish-brown phosphate mineral containing rare-earth metals… It is often found in placer deposits. India, Madagascar, and South Africa have large deposits of monazite sands. The deposits in India are particularly rich in monazite. Monazite is radioactive due to the presence of thorium and, less commonly, uranium. Carolina bays are elliptical depressions concentrated along the Atlantic seaboard within coastal Delaware, Maryland, New Jersey, North Carolina, South Carolina, Virginia, Georgia, and northcentral Florida. Carolina bays vary in size from one to several thousand acres. About 500,000 of them are present in the classic area of the Atlantic Coastal Plain, often in groups, with each bay invariably aligned in a northwest-southeast direction. 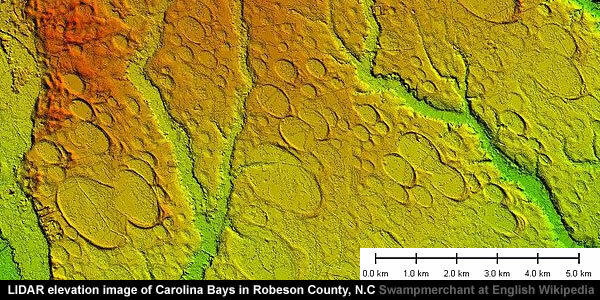 Theories of the origin of the Carolina bays fall into two major categories: that these features were created by forces within the Earth, or that they were gouged by an astronomical event or set of events. In this instance the Carolina Bays were probably created by a Cometary Double-Tap whereby the depressions were first formed by the Comet’s “gas tail” before being blanketed with debris from the Comet’s “dust tail” [containing many elements and compounds from the Coma]. 1) The “gas tail” of the Comet is delivered directly into the Earth’s upper atmosphere. 2) The “dust tail” of the Comet side-swipes the Earth with a debris train. 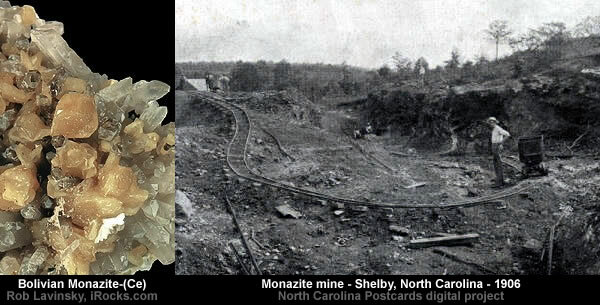 A Carolina Bays Cometary Double-Tap scenario is particularly supported by “a full suite of heavy minerals”, their “high organic carbon (OC) content” and an “impermeable layer underlying”. Stolt and Rabenhorst (1987 a) found feldspars, mica, kaolinite, and quartz. Preston and Brown (1964) identified a full suite of heavy minerals from inside a Carolina bay in South Carolina including; tourmaline, sillimanite, staurolite, kyanite, zircon, rutile, and epidote, monazite, titanite, spinel, and opaque minerals that included; magnetite , ilmenite, hematite, leucozene, opaque rutile, and authigenic marcasite-pyrite. Several studies have focused on the chemical and nutrient aspects of the soil and water found in the depressions. High organic carbon (OC) content in the surface horizons is a common characteristic of Carolina bays. Knight et al. (1985) found over 29.1% OC in northern South Carolina. Shartiz and Gibbons (1982) reported the surface peat layer had a OC content of 8.1 – 44.2% in North Carolina. Quite a few studies of Carolina bay soils have found indications of buried soil surfaces under the rims and in the depressions. Stolt and Rabenhorst (19 87b) found buried organic rich horizons beneath 25% of the rims in 53 bays examined in Maryland. Several studies have mentioned gravelly deposits. These gravel deposits were first mentioned by Glenn (1895), who found moderate sized quartz pebbles in the sands under the rim. One common trait of the underlying strata is an impermeable layer underlying the basin sediments. This layer can be clay to sandy clay material (Buell, 1946; Glenn, 1895; Ingram et al., 1959; Stager and Cahoon, 1987; Grant et al., 1998; and Lide et al., 1995) or a sandy stratum that is cemented by humate (Thom, 1970; Wright et al., 2000; and Knight et al., 1985). The strata in which Carolina bays have formed tend to be restricted to sandy surfaces (Shartiz and Gibbons, 1982; Gamble et al., 1977; Daniels et al., 1999). … Swan Bands suggest Comets are closely aligned with Carbon Stars. Gallery | This entry was posted in As Above So Below, Astrophysics, Atomic Comet, Catastrophism, Comets, Geology, Heinsohn Horizon, History, Solar System. Bookmark the permalink.